ORDER NOW!! 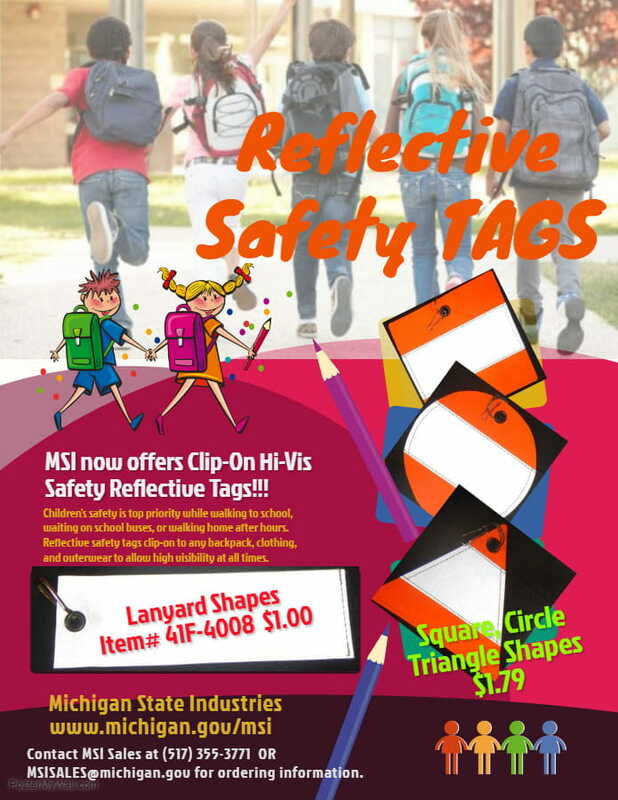 MSI now offers Safety Reflective Clip-On Tags ideal for backpacks, clothing, outerwear, lunch sacks, purses and more for high visibility at all times. Keep children safe while walking to and from school or waiting at bus stops and crosswalks. Tags come with metal clip-on fastners for easy wear. Price: Lanyard Shapes: $1.00 ea. Price: Circle, Square, Triangle Shapes: $1.79 ea. 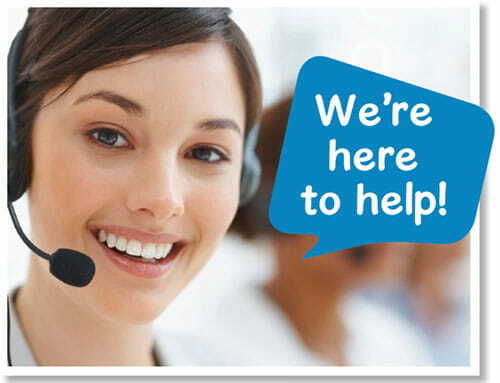 MSI is continuously looking at ways to improve customer service with the ultimate goal of providing superior service to our customers. 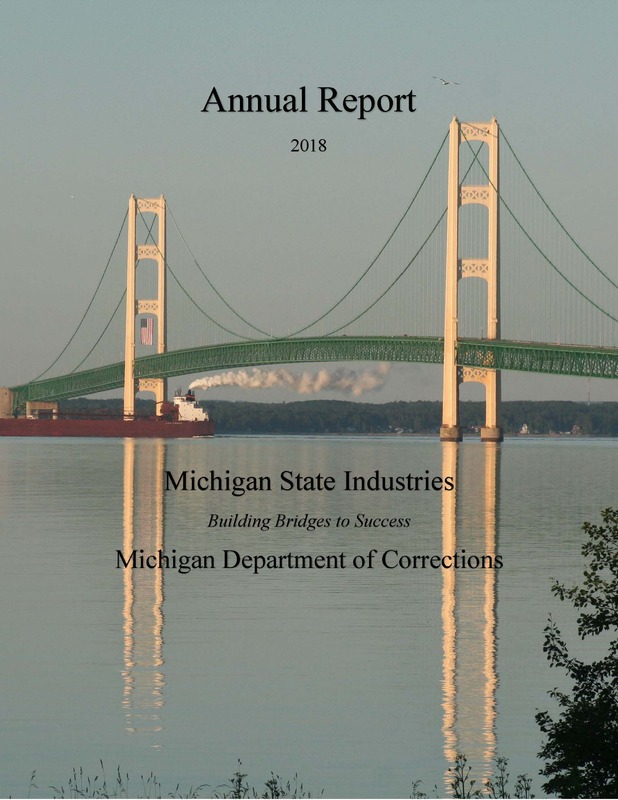 Michigan State Industries (MSI) a program within the Michigan Department of Corrections "Builds Bridges To Success". A State statute stipulates that MSI may ONLY sell its products and services to government entities and nonprofit 501(c)3 organizations. For more information, please see "How to Order". Products produced by inmates include laser-etched and sand blasted wood products, screen printed garments and safety vests, printed forms, posters, and pamphlets, dentures, optical wear, all correctional officer uniform components (except gloves and sweaters), shoes, metal signs and exterior signage of all types, laundry services for state hospitals, select prisons, public hospitals; mattresses, janitorial products and staff outerwear and Michigan license plates. Michigan State Industries receives no state or federal tax support, all of its operations including buildings, equipment, utilities and civil service factory staff as well as offender wages must be funded by the sales of the products and services it provides. With the exception of our cut and sew products, all other products are available only to governmental agencies of all levels and types and 501c3 non-profit organizations. MDOC Field Days Podcast episode. CLICK ON IMAGE TO LISTEN TO MSI PODCAST! !